Apples of Gold� stands behind the craftsmanship of all its jewelry. In addition to our 45 Day Return Policy, we offer a limited warranty on all of our jewelry. All Apples of Gold wedding bands come with a 1-Year Warranty against all manufacturer defects. Apples of Gold, will at its discretion, repair or remake your wedding band at no charge to our customers, after an inspection by Apples of Gold and/or its manufacturers, if a manufacturer's defect is found. All standard jewelry from Apples of Gold comes with a 90 Day Warranty against all manufacturer defects. 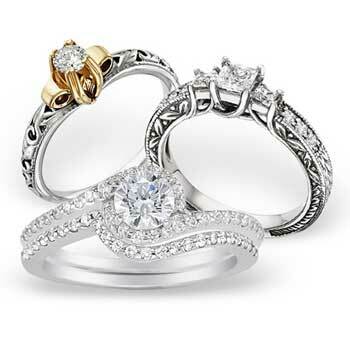 Diamond and gemstone jewelry items are guaranteed free from faulty settings and prongs within 90 days of purchase. However customers are responsible for lost diamonds above 0.15 carats. Other all other defects are 100% covered in the first 90 days. The Apples of Gold warranty is null and void if the jewelry is worked on by another jeweler, not authorized by Apples of Gold. The warranty does not include natural wear and tear, scratches, wearer abuse or damage on the part of the customer, re-sizing, or re-rhodium plating. However, these services are available at an additional, reasonable fee according to jewelry industry standards, under our normal repair services for the life of the product. Customer will be responsible for shipping charges on repair/manufacturer defects on international orders. If you have any questions regarding our jewelry warranty, please contact us!